Performers include: Brett Somers, Richard Dawson, Gene Rayburn, Charles Nelson Reilly, Fannie Flagg, Jonny Olson, Jack Klugman, Adrienne Barbeau, Richard Gautier, Jo Ann Pflug, Loretta Swift, Jimmy Walker, Gary Burghoff, Betty White, Della Reese, Ann Elder, Elaine Joyce, and Anita Gillete. In this revamped version of the 1960s game show, two contestants go head-to-head for a cash prize and to stay on the show and compete for more. In the first part of the game, host Gene Rayburn reads a fill-in-the-blank statement for each contestant who must fill in the missing word. For example, “In the Foreign Legion one soldier said to the other “I think they have run out of French Medals, the colonel just pinned a French (blank) to my chest.” The contestant’s guess is then compared against the answers of a six celebrity panel. One point is awarded for each match. At the end of two rounds, whoever has the most points wins $100 and moves on to the final round or Super Match. For this round, audiences have been surveyed to fill in the blanks for a two word statement such as “(blank) Knight” or “Ham (blank).” The contestant picks three celebrities from the panel for their advice before giving his/her own answer. The top three answers are worth $500, $250 and $100 respectively. If the contestant’s answer is not on the board, the game ends. But, if they match one of the audience’s top three answers, the contestant goes on to play the Head-to-Head Match with a celebrity to win 10 times the amount of whatever money they racked up in the previous round. 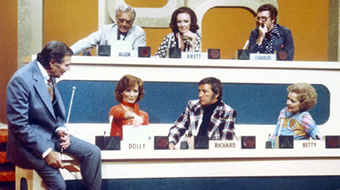 Regular celebrity panelists include Richard Dawson, Charles Nelson Reilly, Brett Somers, Marcia Wallace, Steve Allen, Vicki Lawrence, Nell Carter, and Betty White. The title of the show reflected the year in which it was aired (for example, Match Game ’73) and changed each season. Shame on you for cancelling match game. It was my favorite morning entertainment while I ate my breakfast etc. Hope it returns soon.